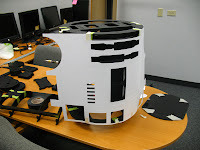 Steve's R2-D2 Building Blog: Droid factory in full swing! Droid factory in full swing! So since I have NO room in my new apartment, I have moved the droid factor to my break room at work (with the bosses permission). It has more then enough room without getting in the way. Plus I can do work on him at lunch. Bonus! Start dry fitting the legs last night. Here is the left leg. After looking online last night, I noticed that the six small holes in the ankle are now different in the new design...so I need to find a way to make the changes. And here are all three legs. Now that I know how they go together, I can start to clean and glue all the pieces. Once that is done it is on to sanding and priming. Did a quick skin line up to make sure everything is matching up. If that doesn't make you excited...I don't know what will. 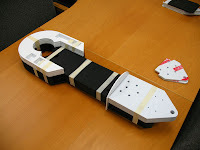 Now that I have a good idea on how everything goes together, I need to start pre-drilling the frame. If I can get the frame glued and screwed before the dome shows up, I will be in pretty good shape. Wow, that's a lot of parts!